It shall put forth branches and bear fruit, and become a majestic cedar. Central idea: Christ is the King of the Kingdom of God and we are called to be his subjects. Doctrine: Christ’s Kingdom is for us, the lowly. Practical application: We can “learn” Christ by prayerfully reading Sacred Scripture. To view Lectionary 92, click here. “I, the LORD, bring low the high tree, lift high the lowly tree.” We hear prefigured Our Lord’s parable of the tiny mustard seed that becomes the greatest of plants, great enough to shelter birds. We also hear an echo of Mary’s Magnificat: “He has put down the mighty from their thrones, and exalted those of low degree” (Lk 1:52). 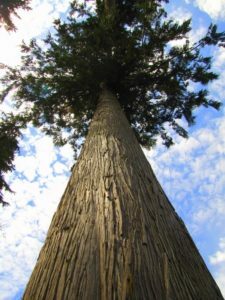 What is the human reality that corresponds to the majestic cedar? It is to have a splendid body, a mind infused with truth, and a will wholly oriented to goodness. We are made to want to be majestic, to dwell in a majestic place, and to be seen by others as majestic. Yet if we find ourselves actually low and fruitless, we can have hope. God has a predilection for us! Living an upright or just life and having real gratitude toward God are two sides of a coin. To be planted in the house of the Lord is to take a stand to live an upright life. The fruit we bear—the good that we do—makes us happy to thank God. But really, it is our gratitude toward God that makes us want to do good. We are planted in the house of the Lord by baptism. We take root and grow by living an upright life. In heaven we will aspire to please the Lord whom we see face to face. In this life, we also aspire to please him whom we only see by faith. It takes courage to live this way simply because we don’t see the award which faith tells us is there and which the world tells us is not. Physical life is a wonderful mystery. It is less mysterious today because of our greater understanding of physics, chemistry, and biology. And this understanding makes living things even more wonderful: we see the incredible complexity, order, and intelligence that living things possess. The farmer is only interested in the final harvest of grains of wheat and he performs only a few actions—plowing, sowing, maybe weeding, and finally harvesting. Yet each wheat plant carries out trillions of actions on its own to produce those grains of wheat. Our spiritual life is similar. We do little things in cooperation with God’s grace: try to speak with God in prayer, receive the Sacraments, perform little acts of service; and underneath God’s grace is at work—we know not how—transforming us into something great—into a harvest for eternal life and happiness. Like the mustard seed, we can be unimportant, our efforts seemingly without success, our numbers few—yet the effect over time can change us and the world. In this reading, Our Lord offers two parables about the Kingdom of God. The King of the Kingdom of God is Jesus Christ. So the subjects of the Kingdom of God are those who serve Christ. To be a subject of Christ requires faith in him, which includes the effort to be upright. It is for everyone who wishes to enter it (CCC 543). It is for the poor and lowly, that is, the spiritually and materially humble (CCC 544). It is also for those who show practical love toward the lowly (CCC 544). We grow as subjects of the Kingdom of God by listening to the Word of God and putting it into effect. The Church exhorts us to learn Christ by reading the divine Scriptures prayerfully (CCC 2653). Prayer accompanies the reading so that a dialogue takes place between God and man. Is there any reason each sufficiently mature Catholic should not spend five or ten minutes every day listening to Christ in his Word and then responding to Christ in his or her own words? Here are two ways this can be done. One is to follow the Sunday (or daily) lectionary readings. Over time, these readings present a very wide range of the most important passages from both the New and Old Testaments. In addition, each set of readings is selected to be mutually enlightening. Another is to steadily work one’s way through the New Testament with special emphasis on the Gospels.